With a school-wide focus on culture this year at Vientiane International School (VIS) in Laos, our central idea was “Our choices and actions as individuals define who we become as a community.” This statement forms the core of a year-long inquiry into attitudes, beliefs, behaviors, and our approaches to teaching and learning. The creation of a mosaic mural to express who we are as a community was one example of the ways in which inquiring into and reflecting upon our community not only made manifest our mission and core values, but further enhanced our sense of community. The project took root in March 2017, when PYP art teachers Angie Andreas and Somphong Yorphashirt brought a group of students to visit the home of a French artist based in Laos by the name of Marie-Do Hyman-Boneu. Although the purpose of the visit was to inquire into a sustainable lifestyle, a mosaic-tiled table in the artist’s home caught Angie’s eye. This eventually led to the school bringing Canadian artist Chantal Leblanc and friend of Marie-Do’s to Laos to work with our primary students on telling stories through art. 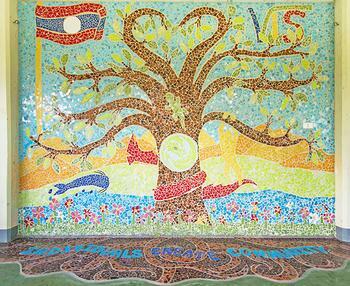 From the planning stage to the final product, the outcome of this initial collaboration was the creation of a mosaic mural on the walls of a local school—a joint project between students from VIS and our sister school, Ban Saphanthong Tai. In August 2017, Angie decided it was time to tell our own school’s story by creating a mosaic mural at VIS. Using Chantal’s technique, the process began by asking students in Prep through Grade 3 classes how we might represent who we are as a community. The ideas generated were then shared with students in Grades 4 and 5, who were tasked with bringing the concepts to life through pictures. The process of creating a collaborative mural begins with determining what you want to communicate, followed by expressing the ideas as drawings, then using components of these drawings to design a scene. Once the upper primary students had created the images, the reflection process began. Students were asked to consider: Does this really represent who we are? Why does the design appeal to you? How does this mosaic relate to us as individuals and as a community? Students articulated the meaning behind their decisions and every part of the mural became symbolic. A tree signified growth. House animals represented communities within communities. The Lao flag symbolized the importance and influence of our host country. The next phase of the project, physically creating the mural, was a well-choreographed endeavor spanning two weeks. Through a collaborative process, sections of the mural were parceled out to students. Our early years students used tiles to evoke grass. Our Lao instructional assistants completed the flag. Indeed, each grade and department was responsible for completing a portion of the mural. Other stakeholders in our community—including parents, board members, and co-curricular providers—participated after school and on the weekends. Each day, the project was a topic of conversation on campus, with individuals checking in on the mural’s progress, students pointing out their contributions to family and friends, and parents dropping by in the morning in hopes of getting a sneak preview. Although the mural was officially unveiled in November for the annual “One World Day” celebration, the final stage of the project took place at the end of May. 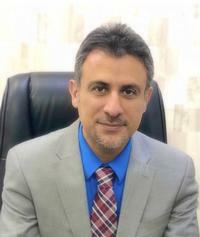 This ensured that any students joining VIS during the second semester had the opportunity to participate in the project as well. This wonderful collaboration, which began with one group reaching out to a local school, has since helped to develop our sense of community at VIS and our connections to others. The positive reverberations continue, as it has allowed us to connect with another regional international school, which has decided to launch a mural project of their own. The process of creating art together translated into a true community-building activity, one that has allowed us to tell a new story about who we are at VIS and emphasize what is important to us. 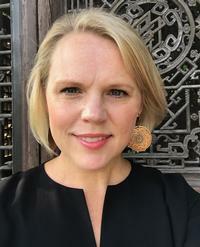 Jane McGee was VIS Director from 2015–2018. 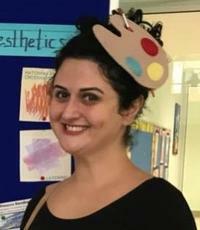 Angie Andreas is PYP Art Teacher at VIS.